Battle for Republican nomination ends with departure of Trump's last remaining rival. 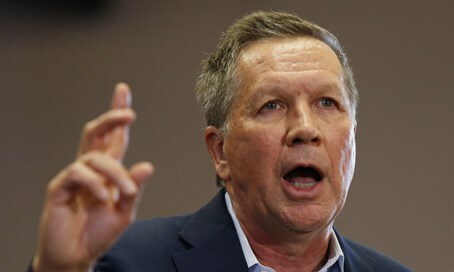 Ohio Governor John Kasich announced the end of his bid to win the Republican nomination for president on Wednesday. Kasich’s announcement came on the heels of Texas Senator Ted Cruz’s departure from the race, following frontrunner Donald Trump’s massive win in Tuesday’s Indiana primary. With his two remaining rivals out of the race, Trump has now effectively sealed up the GOP nomination. Kasich, who failed to surpass Florida Senator Marco Rubio’s delegate count, never had a viable path to the 1,237 delegates needed to clinch the nomination on the first ballot. Instead the dark horse candidate pinned his hopes on a contested convention, whereby bound delegates would be freed to vote as they choose, erasing the advantages Trump and Cruz held over Kasich. With a final delegate tally of 153, Kasich will enter the the convention this July with the fourth largest number of bound delegates, behind Trump, Cruz, and Rubio. Kasich had pledged on Tuesday night to continue the campaign despite Trump's decisively victory. But following Cruz's departure from the race and comments by Republican National Committee Chairman Reince Priebus stating that the party establishment had acknowledged Trump as presumptive nominee, Kasich decided to bow out of the race. The Ohio Governor managed to carry only a single state - his home state. He was competitive in several others, with an impressive second place showing early in the season in the New Hampshire primary.